Thank you to The Olive Table for providing these recipes for us to share! Combine dry ingredients in a bowl and mix well. Add wet ingredients, except for the oil. Once the wet/dry ingredients are combined, drizzle in olive oil as you stir. For a creamy version, pulse dressing in the blender 2 or 3 times until well combined. This refreshing salad takes on various guises in Greece depending on what vegetables are in season, but it almost always features feta and a dusting of dried oregano. Combine parsley, tomatoes, cucumbers, and onions in a bowl. In a small bowl, whisk together oil, vinegar, and oregano; season with salt and pepper and pour over cucumber mixture. Toss. 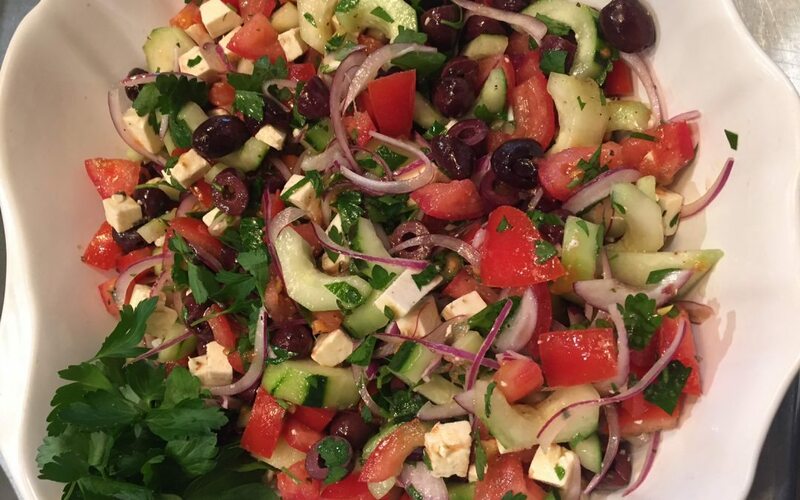 Transfer salad to a serving bowl and top with feta and olives. Garnish with more oregano; season with pepper. The best part is dipping bread into the remaining oil, feta and tomato juice/seeds! Combine the chopped scallions, oil, lemon zest and lemon juice in a food processor and process until smooth. (If you don’t have a food processor, you can use an electric mixer or a wooden spoon instead, but the dip will not be as smooth). Add the feta and process until smooth. Scrape the mixture into a serving bowl. (The dip can be made up to this point a few hours in advance, covered and kept refrigerated). Bring to cool room temperature before serving). When ready to serve, season to taste with salt and pepper and garnish with the sliced scallion.